All My Puny Sorrows is the sixth novel by Canadian writer Miriam Toews. The novel won the 2014 Rogers Writers' Trust Fiction Prize, and was shortlisted for the 2014 Scotiabank Giller Prize, the 2015 Folio Prize for Literature, and the 2015 Wellcome Book Prize. Toews has said that the novel draws heavily on the events leading up to the 2010 suicide of her sister, Marjorie. The novel recounts the tumultuous relationship of the Von Reisen sisters, Elfrieda and Yolandi, the only children of an intellectual, free-spirited family from a conservative Mennonite community. Yolandi, the novel's narrator, has always lived in her sister's shadow: whereas Elfrieda is a gifted, beautiful, happily married, and much celebrated concert pianist, she is something of a failure, with a floundering writing career and teenage children from separate fathers. Yet it is Elfrieda who suffers from acute depression and a desire to die, much like her father before her, who killed himself by stepping in front of a train. When Elfrieda makes a second suicide attempt on the eve of an international concert tour, Yolandi makes it her mission to save her sister, even as Elf begs her to accompany her to a Swiss clinic and enable her death. Yolandi writes: "She wanted to die and I wanted her to live and we were enemies who loved each other." All My Puny Sorrows received starred reviews in Library Journal, Kirkus, and Publisher's Weekly and was a Reference and Users Services Association Notable Book. It also appeared on a number of year-end best-book lists, including The Globe and Mail, The Boston Globe, The Washington Post, The New Republic, and The Daily Telegraph. Reviewing for the New York Times, Curtis Sittenfeld said the novel's "intelligence, its honesty and, above all, its compassion provide a kind of existential balm—a comfort not unlike the sort you might find by opening a bottle of wine and having a long conversation with (yes, really) a true friend." Margaret Atwood praised the novel, calling it a "high-wire act": "What do you do when your beloved and brilliant sister wants you to help her leave this world because she finds her existence too painful? How do you make that into a believable, excruciating but sometimes wildly funny work of fiction?" Naomi Klein described the novel as "shockingly funny, deeply wise and utterly heartbreaking." All My Puny Sorrows won the 2014 Rogers Writers' Trust Fiction Prize. The jury described it as "a haunting novel of tremendous feeling, beautifully written and profoundly humane... Miriam Toews, a dazzling literary alchemist who manages to summon all the joyous and heart-breaking humanity of her characters, has produced a work of astonishing depth. Reading it is an unforgettable experience." The novel also won the 2015 Canadian Authors Association Award for Fiction and Italy's 2015 Sinbad Prize for Foreign Fiction. All My Puny Sorrows was shortlisted for the 2014 Scotiabank Giller Prize, the 2015 Folio Prize for Literature, and the 2015 Wellcome Book Prize. It was longlisted for the 2015 Andrew Carnegie Medal for Excellence in Fiction and the 2016 International IMPAC Dublin Literary Award. ^ Bethune, Brian (11 October 2014). "Miriam Toews wrestles with suicide in her latest quest for narrative truth". Maclean's. ^ Bland, Jared (April 18, 2014). 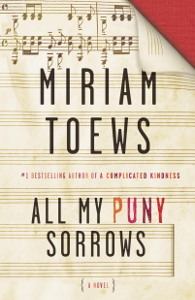 "All My Puny Sorrows: Miriam Toews's latest is a funny novel honouring deep sadness". The Globe and Mail. ^ Taylor, Catherine (June 23, 2014). "All My Puny Sorrows review: 'biting black humour': This tragicomic story of a suicide bursts with ramshackle, precious life". The Telegraph. ^ "All My Puny Sorrows by Miriam Toews: Review". Toronto Star, April 15, 2014. ^ Davies, Stevie (July 9, 2014). "All My Puny Sorrows: darkly fizzing tragicomedy". The Guardian. ^ Charles, Ron (November 10, 2014). "Book review: 'All My Puny Sorrows' by Miriam Toews". The Washington Post. ^ Hoffert, Barbara (February 10, 2015). "Notable Books and More - ALA Midwinter 2015". Library Journal. ^ "The Globe 100: The best books of 2014". The Globe and Mail. November 21, 2014. ^ "Best Fiction of 2014". The Boston Globe. December 6, 2014. ^ "The Top 50 Fiction Books for 2014". The Washington Post. November 20, 2014. ^ Schama, Chloe (December 31, 2014). "The Best Fiction of 2014". The New Republic. ^ "The Best Books of 2014". The Daily Telegraph. November 3, 2014. ^ Sittenfeld, Curtis (November 21, 2014). "'All My Puny Sorrows' by Miriam Toews". The New York Times. ^ "Books of the year: the essential NS reading list". The New Statesman. November 21, 2015. ^ "Writers pick the best books of 2014". The Guardian. November 29, 2014. ^ Dundas, Deborah (November 4, 2014). "Miriam Toews wins $25,000 Writers' Trust Fiction Prize". The Toronto Star. ^ "Rogers Writers' Trust Fiction Prize: 2014 Winner". November 4, 2014. ^ "Canadian Authors Association announces 2015 winners of Canadian Authors Literary Awards". www.thebpc.ca. Retrieved 2015-08-08. ^ "Libri, Miriam Toews e Tommaso Pincio vincono a Bari la prima edizione del Premio Sinbad". La Repubblica. November 21, 2015. ^ "Giller shortlist features Miriam Toews, David Bezmozgis among books in battle for $100,000 prize". National Post. 6 October 2014. Archived from the original on 2014-10-21. Retrieved 2015-02-10. ^ Dundas, Deborah (February 9, 2015). "Miriam Toews Shortlisted for Folio Prize for Literature". The Toronto Star. ^ Brown, Mark (March 9, 2015). "Wellcome Book Prize Shortlist Mixes Grief and Joy". The Guardian. ^ "Awards Longlist". The Andrew Carnegie Medal for Excellence in Fiction. American Library Association. ^ "10 Canadian novels on the 2016 longlist". The International Dublin Literary Award. International Dublin Literary Award.